Leave it to Marvel's resident info-spiller to potentially spoil a major element of Spider-Man: Far From Home. Spider-Man star Tom Holland recently uploaded a video to his Instagram account, and it caught the eye of many a Marvel movie-lover. The video shows Holland coming to us live from the Spider-Man: Far From Home set and speaking about The Brothers Trust, the charity Holland's parents, Nikki and Dom Holland, established to highlight smaller charitable organizations that are often overshadowed by more well-known movements. The Brothers Trust is currently offering two lucky fans the chance to take a trip behind the scenes of Far From Home and hang out on set with Holland himself. It's a lovely little announcement video featuring our favorite Brit who does an impeccable Brooklyn accent in his film series, but there's a lot more to it than it seems. In fact, one outwardly inconsequential aspect of the footage could have noteworthy implications. Though Holland resisted the urge to verbally leak any details about Far From Home, he inadvertently gave everyone a look at his costume for the movie — and it isn't the Iron Spider suit he wore in Avengers: Infinity War. Instead, it's the same get-up he rocked in Captain America: Civil War and Spider-Man: Homecoming. Gifted to Spider-Man by Iron Man (Robert Downey Jr.), the Iron Spider suit is equipped with a ton of bells and whistles — including on-the-go web generation, digital camouflage to keep him hidden from baddies, self-contained environmental protection, upgraded durability, armored web shooters, spider legs, and a bunch more — and is lacquered in a film of diamond nitrile. That's essentially just a really fancy way of saying that the Iron Spider armor, though difficult to control without fully understanding how to use its many mechanisms, makes the wearer nearly invincible. Peter stepping into the suit for Infinity War was a smart move, as it allowed him to survive in space and aided in his offensive and defensive actions. The only thing it didn't protect Spidey from was, unfortunately, Thanos' (Josh Brolin) snap that slashed the universe's population in half. Marvel Studios president Kevin Feige previously noted that Spider-Man: Far From Home takes place after both Infinity War and Avengers 4, which is due out in May of 2019, just two months before the Spidey sequel swings into theaters. 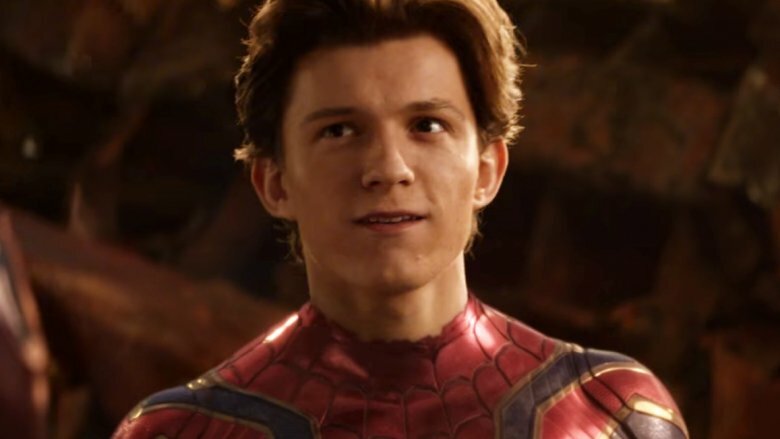 Because of that fact and because Spider-Man is confirmed to appear in Avengers 4 despite apparently dying at the end of Infinity War, many believe that the web-slinging hero will wear the Iron Spider suit in Avengers 4 — but they also argue that whatever goes down in that film will force Peter to revert to his Civil War/Homecoming suit in Far From Home. Does the sleek, state-of-the-art suit get destroyed in Avengers 4? Does Tony Stark, thinking Peter isn't capable of handling the responsibility that comes with wearing the Iron Spider suit, take the armor away? And if Spider-Man really does lose the Iron Spider suit, will the sudden lack of upgrades impact his ability to fight his formidable foes in Far From Home? We don't have clear-cut answers to those questions right now — and won't at least until the fourth Avengers flick launches next year, since Marvel probably isn't going to give up any details before then. (Remember how secretive the studio was about Infinity War?) For now, there's a chance that, regardless of the reason for its absence, the Iron Spider suit might not be in Spider-Man: Far From Home. However, there's an equally strong chance that it will be in the upcoming sequel. Knowing that both Marvel brass and Marvel fans have their eyes on Holland, watching to see if he'll slip up and reveal something he isn't supposed to, the actor could have purposefully mislead everyone into crafting these costume-related theories. Maybe Spidey solely sports the Iron Spider suit in Far From Home, but Holland simply wanted people to believe the opposite, and thus wore the Homecoming suit for the Brothers Trust announcement video. Then again, this could all be explained away with the mention of good ol' CGI. The Iron Spider suit was apparently rendered in post-production for Infinity War, seeing as though Holland was spotted wearing a motion-capture suit on the film's set. Since he isn't wearing one in this new video, there remains the possibility that Far From Home will feature the Iron Spider suit at some point.